Nothing but the scraps 3rd Friday Freebie! Well, how much pie did you eat yesterday? I hope your Thanksgiving was wonderful. Ours was for sure! So very much to be thankful and grateful for. 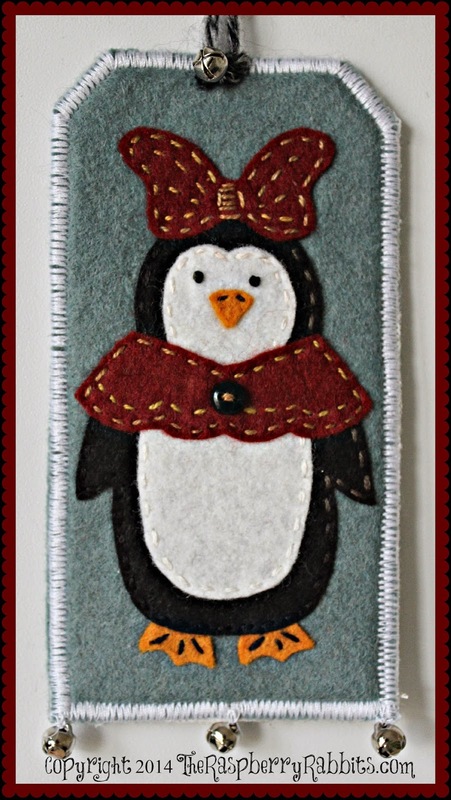 This week Polly Penguin makes her debut for our third Friday Freebie. I do hope you have been enjoying these patterns. There will be five designs in all, but they will only be Free for a limited time. These are my gifts to you this year. So, please pass the word to your stitching friends. 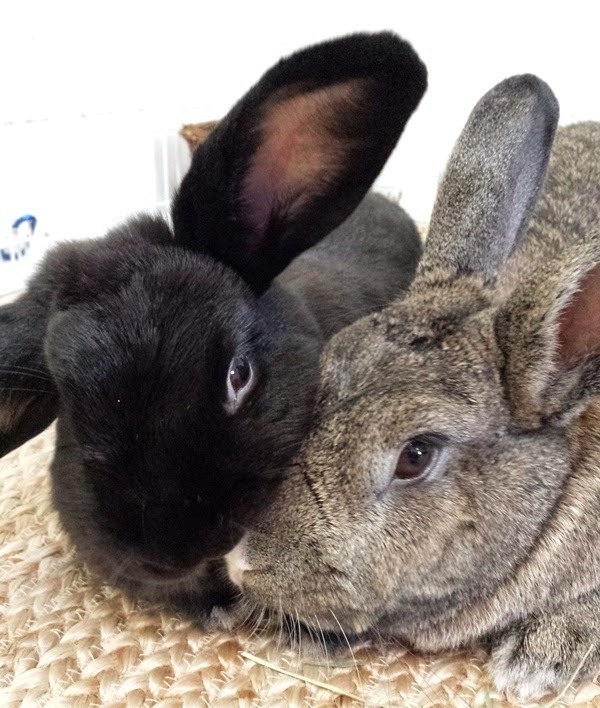 The bunnies and I would love for them to come by and meet us here on our blog. 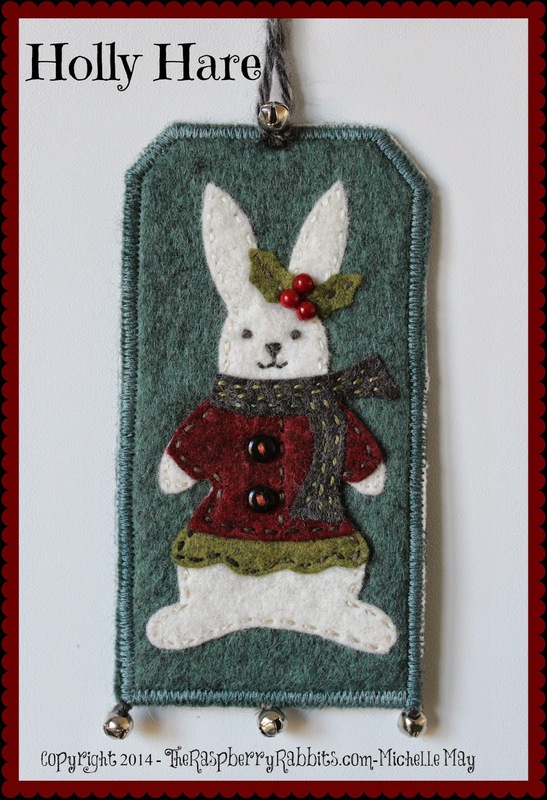 Hop over to my Craftsy Shop for the pattern. Michelle, the Bunnies and Sabrina kitty too! Eleven projects down and only our grand finale left! Woo hoo! I hope you have had fun so far. 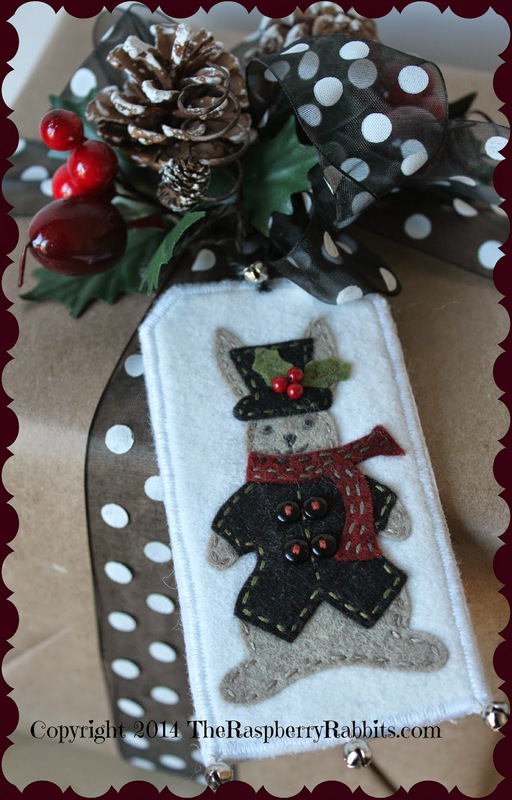 This project has lots of stitching and embellishments. Members in the Fellowship will be receiving their instructions by email today. If you would like to join us, you have until December 17th. Please click on the tab above for all the information. Here is our flower for Week 48. I also love that little button I found. Makes me smile. Safe travels to all of you who are traveling for Thanksgiving. David and I will be traveling across the street to Captain's. It's going to be such a fun time! See ya back here Friday with another FREE tag/ornament pattern. Hi ya! Well, as usual, I'm running around like a crazy bunny. I have way too much to do and not enough hours or fingers to get it all done. Always the case isn't it? Anyway, here is a little sneaky peeky of the November Fellowship of the Flowers project, which will be coming out on Wednesday. This is our 11th project. Remember, you only have until December 17th to sign up and get all the projects. On December 18th it will all go away. I still have a few kits available. Click on the tab above for more information. 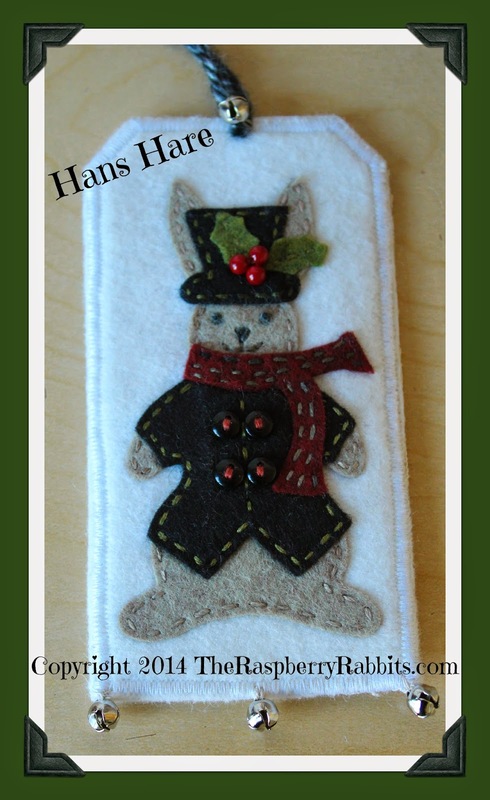 This week we bring you Hans Hare! Such a dapper bunny he is. He and Holly Hare are party animals. They are ready for lots of celebrating. I used a linen blend for the back of this tag. These are the Valdani 3 strand floss colors we used. Hans looks great on a present. You can HOP over here to our Craftsy store for the pattern. The bunnies, Sabrina and I would like to thank all of you who also purchased a pattern from our Craftsy shop. We truly appreciate your friendship and support of our small business. We wouldn't be here without you. We send our sincere thanks. Michelle, the Bunnies and Sabrina too! Good gracious it's cold outside! I can't believe how many people have snow already. It makes me think back to when we began this flowery journey 47 weeks ago. This year has really gone by so very fast. Here is our flower for week this week. This is how it looked before I stitched and embellished it. I really love these little green beads. I have been collecting a bunch of beads for a while now and like to add them to my Folk Art Fusion designs. I think it gives a little bit of sparkle. Don't forget, you will need 18 bees for the final project on December 17th. You can embellish them if you like or just assemble them and have them ready to go. See ya back here on Friday with another FREE Christmas tag/ornament. I can't wait to show you. Are you ready for Thanksgiving? I am. David and I are walking across the street to Captain's house to enjoy a wonderful feast with our fun friends. I'm making Sweet Potato Fluff, Roasted Veggies and a Pumpkin Pie. 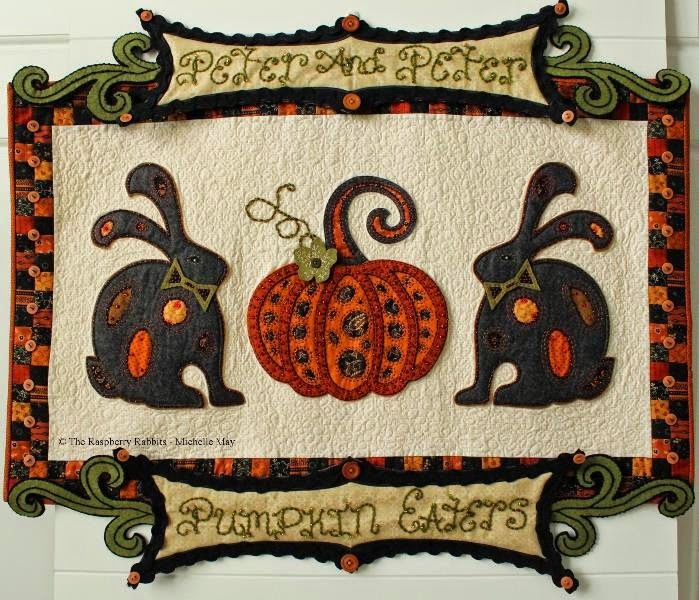 I decided to hang "Peter and Peter Pumpkin Eaters" in my dining room for October and November. I realized I didn't share the photos from last month's guild meeting, so here we go! Marianne shared her kid's donation quilt. I love these colors. Gerri shared the quilt she made from all the Christmas blocks we made last year. She was a lucky winner of the blocks at our Christmas party. She also shared this faaaaaaaaaabulous quilt she made from a Pat Sloan quilt along. I love it! This block is super cute with the candy corn flowers! I need to take photos of Gerri's house. 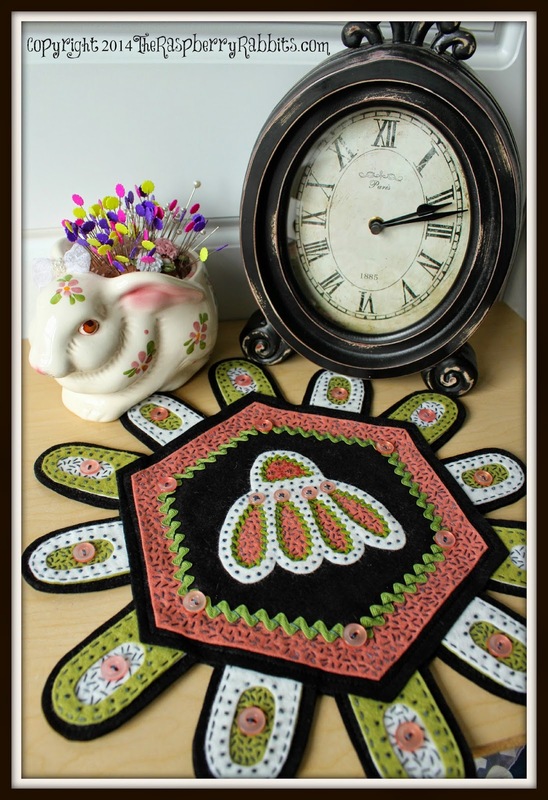 She has the most wonderful vignettes filled with quilted and stitched pieces. Mary shared pineapple art quilts which were made by her art quilt group. These were for the Day of Sharing in which the theme was pineapples. I also loved how she made this diagram of a pineapple. Y'all know I can't grow stuff so this was amazing to me. I will admit that I thought pineapples came from trees like bananas. Hee,hee,hee. I want to send a CONGRATULATIONS shout out to Mary as well. She had an art quilt juried into a local art show. Way to go Mary! 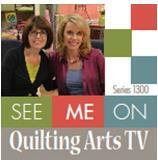 Lori shared this quilt block from the guild's mystery quilt along. I adore those colors! She also shared this beauty. Nothing more fun than a red, white and blue quilt. Peggy aka, the perfect point maker, shared her kiddo quilt. I think it is really cute. However, I asked her to bring the pineapple quilt she showed at Day of Sharing. I looooooooove this! Here's a close up. Simply gorgeous! Peggy always amazes me. She is very talented. Sandy shared this table topper. Sorry the photo isn't that good, she was wiggly when I was trying to get the shot because everyone was asking her questions about it. Isn't it cool? Renee shared this adorable kiddo quilt. I looooooooooove this fabric! LOVE IT! and this cute Care Bear quilt. I know the kiddos will love all of them! Pam shared her fun quilts too. This one she said she appliqued the stars on after the quilting had been done. I think it turned out great! Carolyn shared her kiddo quilt. She loves bright colors and makes such wonderful bright quilts. She can also knit and is making a gorgeous afghan for her son in law. I will have to take a photo for you. Well, there is the show and tell from our October meeting. I won't be there for the November meeting because of David's surgery. I am looking forward to our December meeting and party. Instead of doing a block exchange, we are doing a pot holder exchange. I think it will be really fun and I want to come up with something unique to make for this. Any ideas you can share with me? Nothing but the scraps Friday Freebie! So, did you dig out your pile(s) of scraps? Were you reminiscing over past projects as you looked at them, or were you feeling like you might be able to make an appearance on one of those hoarders shows? hee,hee,hee. But, ya know I had to start off with a bunny. That is just a given around these parts. This is Holly Hare. She is all dressed up and ready for a Christmas party. 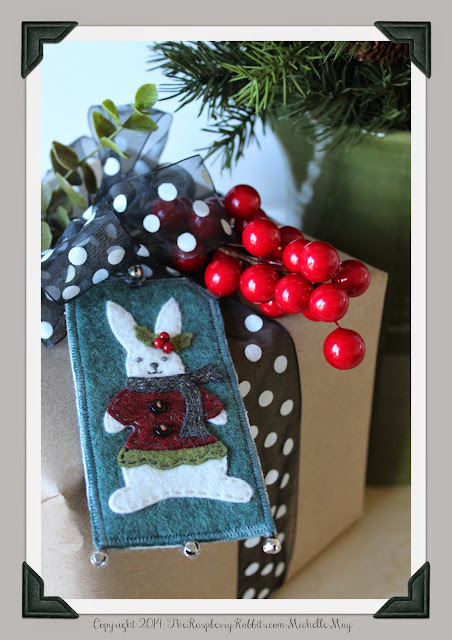 These tags are a great way to dress up a present, and they also make wonderful gifts for friends who have everything. Your handwritten note and the date make these perfect little keepsake ornaments. 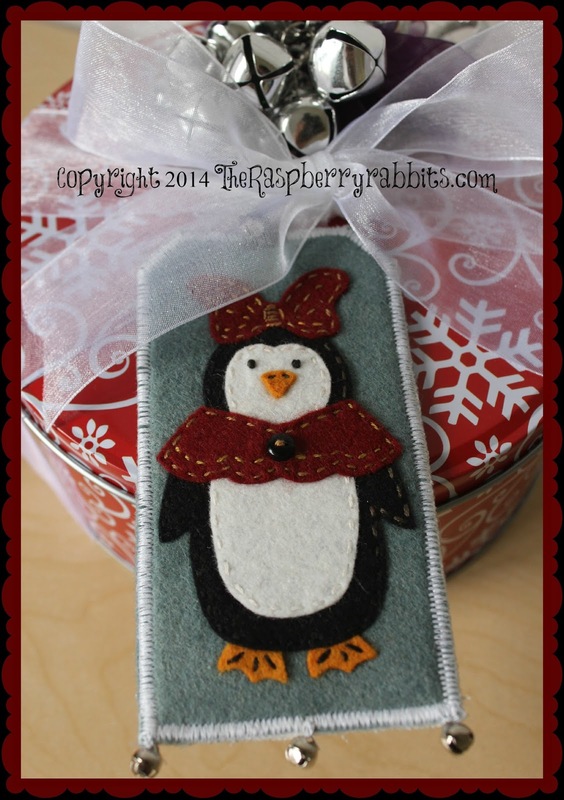 So HOP on over to my CRAFTSY shop and get the free pattern (limited time only). 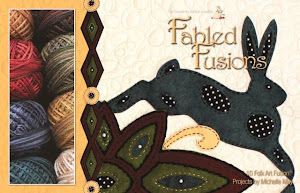 While you're there, take a look around at some of my other patterns. By request from my customers and friends, I have recently added some of my previous designs. I hope you enjoy my little gift to you and I hope it will inspire you to spread some light and love to your friends and family. Handmade gifts from the heart are always the best. Another week down and only four to go! Here we go with week 46 of the Fellowship of the Flowers. This week I added some beads and some gorgeous hand dyed yarn a friend gave me. Here's how it looked before I stitched it. What an adventure this has been so far. Coming up with a different color combination and stitch series on a flower every single week this year has been a fun challenge for me. Of course, it's also been a challenge to design and write patterns for twelve different projects on top of my other designs, but I did it! :) I think you will really enjoy the last two projects. I can't wait to show you. Remember, you have until December 17th to join us. After that, all the patterns and projects will go away. The Fellowship Tab at the top of my blog will remain for one more year so those who are members can catch up. Click that tab for information on how to join. See ya back here Friday with our first of the Five Friday Freebies using nothing but scraps! Michelle and the fuzzy ones.